'In my opinion, the coefficient used for calculating the blitz ratings is too high. It's clear that the coefficient cannot be the same for rapid and blitz, because one can play much more blitz games than rapid ones within a given period. 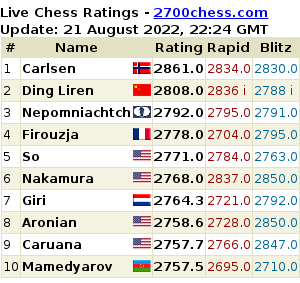 My blitz rating (2798 - CN) has strangely soared exactly for this reason: I've gained nearly 100 rating points after just two successful tournaments. This is absurd, of course'. Some Interesting Mathematics. Alexei Shirov: "The Rating System Needs Amending Urgently"
Grandmaster Alexei Shirov believes that the system for calculating ratings for classical, rapid and blitz chess needs changing as soon as possible. He wrote about this on his Facebook page. David Navara's new personal record is perhaps the most significant change in the April FIDE rating list, compared to the previous month. The Czech GM has 29 games counted for April 2015 (European Championship, Reykjavik, and the national Extraleague played last autumn) and is now occupying the 18th world rank with 2744. The men's and women's updated rating lists (as of 1 July) appeared on the FIDE site today. 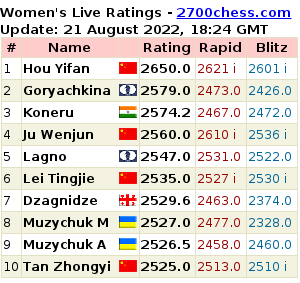 There were no sensational changes in the classical ratings and, despite Emil Sutovsky's assurances, Hou Yifan is still rated second among women.